Families from the Tzeltal community of Banavil, Tenejapa municipality, Zapatista sympathizers who were displaced on December 4 (2011) after being attacked by pro-government caciques at the head of some 30 people, demand the appearance of their father, Alonso López Luna, and the immediate release of Francisco Sántiz López, Zapatista support base falsely accused of attacking the mentioned attackers, seeing that he was not even at the scene of the acts. Lorenzo López Girón, son of the disappeared, received two bullet wounds from PRI caciques Alonso López Ramírez and Diego Méndez López, and stayed in prison more than three months accused of injuries. They also ‘disappeared’ Alonso. “As of today, we have no results on the investigation of where he is,” say the relatives, who had to abandon Banavil. On December 23, they found an arm in the Mercedes ejido. The Public Minister (similar to a district attorney) for the Indigenous Office went to pick it up. “We identified that it was our father’s arm. As of today we don’t know what the aggressors did with the body and we demand an investigation to yield its whereabouts.” They identify those that beat up and took him away as Méndez López and Guzmán Méndez, as well as Agustín Méndez Luna, Manuel Méndez López, Alonso and Agustín Guzmán López, Antonia Girón Gómez, Lucía López Ramírez and Antonia López Pérez (de Banavil), together with Pablo López Intzin, Antonio and Alonso López Méndez. The family members recall that the Good Government Junta of Oventik already denounced that Alonso was beaten up when the party-member aggressors broke into his house on December 4, and they testify: “We saw them take him away, and according to comments from the people of Banavil, they killed him, cut him into pieces and hid the remains.” To the contrary, the disappeared (Alonso López Luna) is accused of having killed Pedro Méndez López, a PRI member who died in the attack. Finding themselves isolated from the organized “political prisoners” in some Chiapas prisons, Miguel Vázquez Deara and Antonio Estrada Estrada, Other Campaign adherents from San Sebastián Bachajón ejido, face their imprisonment, which they insist is unfounded, in conditions of great solitude. Boca en Boca [“by word of mouth”] is an independent news sheet that aims to spread news of what is happening in the organized communities of Chiapas. It aims to oppose the strategy of the government and generate solidarity among the people by providing summaries and extracts from the communities’ news releases. Greetings to all those who continue to look at the hopes of the people of Chiapas. Let’s keep spreading the word of the organized peoples, those without voices, throughout the world. It can be found in Spanish, English, Italian, Portuguese, French and Tzotzil (Chiapas Mayan dialect), for a more open distribution of this news sheet. We invite you to follow Kolectivo BoKa En BoKa on our Facebook page. We invite you to support us in spreading the just word of Chiapas, Mexico. We remind you that you can have direct access to links for more information on the news items via the .pdf format. If you need the magazine in another language, or can offer translation into any language email us! “The peoples must persist in organization for defending our territories, faced with the lack of procurement of justice and the impunity of the bad governments, who besides not guaranteeing the security of our communities and peoples, and procuring plunder and widening the poverty gap, are accomplices or directly responsible for the violence against those of us who decide to organize autonomously, by means of threats, repression, harassment, legal processes and murders.” This was the conclusion of over thirty civil organisations, ejidos and grassroots movements that met in this city. They demand the cancellation of the more than one hundred legal processes against members of the National Network of Resistance against the High Rates for Electric Energy. They also demand: “that they stop the constant attacks by paramilitary groups on the communities and organizations that struggle for their autonomy, justice and to guarantee the exercise of individual and collective human rights los” in different states. Thus, they repudiate the attacks committed against the Purépecha community of Cherán on April 18, whose talk at the seminar was cancelled. The following participated, among others: Indigenous Peoples Assembly of the Isthmus of Tehuantepec for the Defense of Land and Territory, Victoria Diez Human Rights Centre, Oralia Morales Human Rights Committee, Regional Autonomous Council of the Coastal Zone of Chiapas, Regional Coordinator of Community Authorities-Community Police and Xi’Nich. “We, the undersigned, representing the groups listed below, on Saturday April 21st 2012, when gathered at Bradford, England for a meeting of the UK Zapatista Solidarity Network, agreed to offer our support to the “WEEK OF GLOBAL STRUGGLE FOR THE LIBERATION OF PATISHTÁN AND SÁNTIZ LÓPEZ: BRINGING DOWN THE PRISON WALLS” which has been convoked by our brothers and sisters from the Movement for Justice in El Barrio, The Other Campaign New York. This week is to take place from Tuesday, May 15 to Tuesday May 22 of this year, and in our different groups we will be organising different actions in support of the immediate release of these two political prisoners, who are symbolic of the many people unjustly imprisoned, apparently for crimes they have not committed, but in reality for their political convictions. REDD (Reducing Emissions from Deforestation and Forest Degradation) is a United Nations program meant to fight climate change. It will be put into effect after the Kyoto Protocol expires in 2012, and it includes forests on the Carbon Credit market.With REDD, the companies that contaminate the planet the most will be able to continue their activity if, in return, they financially support communities in the South to conserve the forests they live in. According to the program’s promoters, it will absorb these companies’ Co2 emissions, thereby saving our planet, while at the same time these communities grow economically. “These mechanisms fulfill the objectives of sustainable development: they fight poverty and climate change at the same time”, Mexican president Felipe Calderón declared at the COP16 in Cancún.As such, it purports to combat global warming without reducing greenhouse gas emissions, and without putting the capitalist system and its excesses—the real causes of environmental disaster—on the table. Analyzing the application of REDD to the Lacandon Jungle in the Mexican state of Chiapas, all of the problems that the programme brings with it begin to stick out. California and the state of Acre (Brazil) have for some time now had their eyes on the Chiapan jungle, Latin America’s second lung. In November 2010, the two governments signed an agreement with governor Juan Sabines Guerrero laying the foundations for REDD’s introduction in Chiapas.Already in 2009 the state government initiated its Program for Action Against Climate Change in Chiapas (PACCCH), thanks to the support of the British Embassy, Conservation International, NGO conservationists (that have the important role of being intermediaries to communities) and academics. Out of all of these, it is the researchers from ECOSUR (El Colegio de la Fontera Sur) who are working on a document to implement REDD+ in Mexico. ECOSUR is also creating a Forest and Soil Inventory to identify which areas take priority in terms of greenhouse gases and carbon sinks, in order to facilitate investment in REDD+. A former WalMart de Mexico executive, Sergio Cicero Zapata, in charge of WalMart’s real estate department for ten years until 2004, sent emails to a senior WalMart lawyer in September of 2005 documenting a US$24 million bribery campaign that helped WalMart become the largest retailer in Mexico. Many of the bribes involved construction permits, reductions in environmental impact fees, avoidance of fines, access to confidential information, and payments to neighborhood leaders in exchange for political support. Within days, WalMart investigators, sent from the US, discovered a paper trail documenting the bribes along with extensive participation by WalMart de Mexico executives. The lead investigator- a former FBI agent -reported, “There is reasonable suspicion to believe that Mexican and USA laws have been violated.” But instead of following the investigation to its conclusion, WalMart turned it over to their Mexican general consul, the same person who authorized many of the bribes. This turns out to be common practice for WalMart when faced with internal ethics problems. He quickly exonerated his fellow executives and submitted a final report that the original investigator characterized as “truly lacking.” The initial findings were never reported to US or Mexican officials. Instead, WalMart promoted the central figure in the bribery scheme, former chief executive Eduardo Castro-Wright, to vice-chairman of WalMart in 2008. The article does not touch on Banco WalMart, a Mexican invention that allows WalMart retail outlets to function as banks without the government oversight required of its competitors. Banco WalMart recently signed up its millionth account. Banks like Banco Wal-Mart, which are subsidiaries of foreign corporations, are meant to be regulated by the bank regulators in the parent’s country. But because regulators in the US have consistently refused to allow Wal-Mart to become a bank, US regulators don’t oversee its Mexican subsidiary. WalMart’s unprecedented growth, fueled by corruption and bribery, made it Mexico’s largest retailer, forcing many small and medium sized competitors out of business, while also making WalMart de Mexico the rising star of an international monolith. Today, one in five WalMart stores is located in Mexico where the company employs 209,000 people at 2,099 retail outlets, making it the country’s largest employer. WalMart de Mexico accounts for 8% of WalMart’s annual net sales and more than a quarter of all Latin American company sales. WalMart de Mexico controls 62% of the country’s retail food market. In recent meetings with President Felipe Calderon, WalMart Chief Executive Mike Duke said their Mexican business is an example to be emulated at the global level by other WalMart divisions. We send you all warm embraces from El Barrio, New York. We would like to share with you a very brief, but important, update concerning our call to action. Firstly, we are pleased to report that various groups and collectives from the following countries have already joined our convocation: Mexico, South Africa, Brazil, England, Scotland, Spain, and the United States. We ask that you please circulate the video widely. Hopefully the emotion and rage with which Gaby speaks in this short video will touch our hearts and move us to action to free our two compas who remain hostages of the bad government and the represors who control it. Thank you. Let’s move forward, compañer@s! To take place from Tuesday, May 15 to Tuesday May 22 of this year. We send you our affectionate embraces and greetings on behalf of Movement for Justice in El Barrio, The Other Campaign New York. We wish to share with all of you an urgent proposal from the humble and simple migrant community of El Barrio, New York. Over here on the “other side,” we find ourselves with relentless anxiety trembling in our skin. We have observed from afar the cases of unjust incarceration of the political prisoners: Alberto Patishtán Gómez, an adherent of The Other Campaign, and Francisco Sántiz López, member of the Zapatista Support Base communities since 1992. For us, the dignified struggles of our compañeros are an occasion to reflect and rebel against a political and legal system that has nothing to do with justice or rights. We have witnessed with much pain all the attempts to dehumanize Alberto Patishtán Gómez and Francisco Sántiz López – from the false accusations to the legal inconsistencies – of the bad government via its three levels and its rulers from every post, such as the repressor Pres. Felipe Calderón and the repressor Gov. Juan Sabines . They seek to erase the faces of our compañeros to make them invisible. They seek to erase the words of our compañeros to silence them. They seek to eliminate their phyisical freedom so that they cannot fight anymore. Because it is easier to bury beneath prison walls a human body that lacks a face, makes no sound, has no life. But we continue listening to them from afar, and their dignified cries, their indispensable lives, call us to walk alongside them to obtain their freedom. They call on us to unite our forces in order to knock down the walls that surround them. The prison system constitutes part of the racist politics of the world capitalist system. We know that it is no coincidence that in Mexico, as well as here in the United States, the jails and prisons are filled almost exclusively with those from below – indigenous, migrants, black, poor, Latino, women and men, and all marginalized groups – since only the true criminals could benefit from this misery: the multinational corporations and their political lackeys. Those from above believe that people who struggle must be crushed and encaged. Alberto Patishtán Gómez was born on April 19, 1971 in the Chiapas municipality of El Bosque. 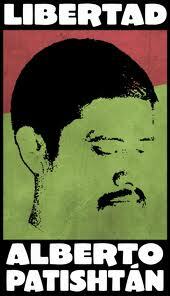 He was arbitrarily deprived of his freedom on June 19, 2000 for crimes he did not commit. Two years later he was sentenced to 60 years in prison. When this injustice took place, Patishtán was very active in the political life of his community. He had been an outspoken critic of the corruption of politicians and political institutions. Despite the horrific prison conditions and his health problems, Alberto has not given up. On the contrary, he continues fighting from inside. Known as Professor Patishtán, Alberto was an elementary teacher at a local public school and during these past 12 years has continued to be an exemplary fighter for justice for his two children, other prisoners, and his compañeros from around the world. Adherent to The Other Campaign since the release of Sixth Declaration of the Lacandon Jungle, his dignified example teaches us that the rebel spirit cannot be contained. 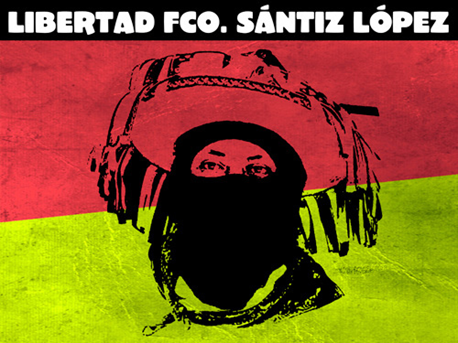 Similarly, since December 2011, our compañero Fancisco Sántiz López, member of the Zapatista Support Base communities since 1992, has been unjustly incarcerated and falsely charged with having lead a confrontation, which occurred in the Banavil community of the Tenejapa municipality of Chiapas, in which a member of the PRI party died. The racist and political character of this incident is obvious. 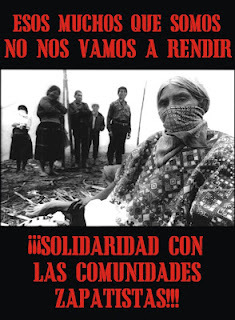 As the Zapatista Good Government Council of Oventic explains, “The fabrication of crimes against our compañero comes from Los Pinos [the Mexican presidency], with the end of destroying the resistance of the zapatista communities; they are trying to impede at any cost the construction of the autonomy of indigenous peoples, it is part of a strategy of low-intensity warfare against our communities in resistance.” Recently, on March 22 of this year, our compañero Francisco, as he was about to be released, was hit with another accusation of another false crime. For this reason, he remains at the moment a political prisoner, despite the fact that witnesses have corroborated the fact that Francisco Sántiz López was not at the site of the confrontation. Additionally, the Fray Bartolomé de Las Casas Human Rights Center has published a report indicating the names of those responsible for the murder. Obviously, the truth, much less justice, means little to the authorities. From Tuesday, May 15 to Tuesday, May 22 of this year. LONG LIVE ALBERTO PATISHTÁN GÓMEZ! LONG LIVE FRANCISCO SANTIZ LÓPEZ! LET US BRING DOWN THE WALLS OF INJUSTICE! Nuevo Paraíso’s problems started, according to the Junta, last October 26, “when residents of Pojkol entered our coffee fields to cut the coffee; they were armed and fired several high-calibre bullets.” The invaders damaged 3 hectares and removed 1, 800 kilos [of coffee]. In November, they stole from the collective milpa, 4 hectares which produce 100 zontes (some 35 costales) of corn. On January 9, the invaders from Pojkol (Chilón) “began to cut down fine trees, which they are still doing today,” on recuperated lands “that were already paid for with the blood of our fallen ones.” The Junta denounces Miguel Gutiérrez Feliciano and Domingo Gutiérrez Ruiz, the leaders of this ejido, as the ones responsible. The invaders from Las Conchitas belong to the Rural Association of Collective Interest-Union of Unions (Aric) “historic”, represented by Marcos Gómez Morales, “known as a human rights defender,” Plácido, Marcos and Fidelino Gómez Morales, Fidelino Gómez Lorenzo, Carmelino Ruiz Guillén and Reynaldo Morales González (“known as a killer who has a prior criminal record,” asserts the Junta). The pro-government people (oficialistas) from Guadalupe Victoria invaded coffee fields in November and cut down three hectares. On March 17, they destroyed one more hectare that belongs to Francisco Villa autonomous municipality and they planted milpa. On March 27, they invaded six hectares of pastureland, fumigated it with agro-chemicals and stole the wire fence. They also fumigated a hectare and a half of improved pastureland. 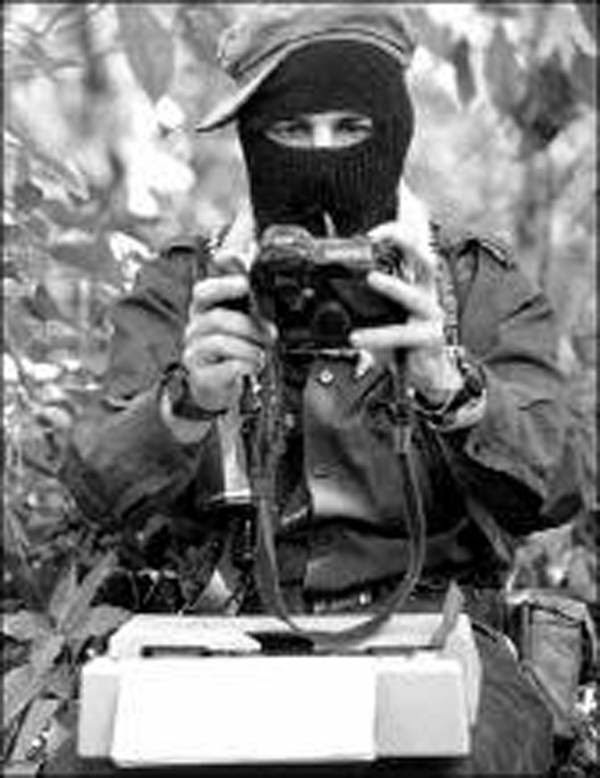 That same day on the highway that leads to the fields, five armed men impeded the passage of Zapatista campesinos. On April 22, 119 members of the Regional Organization of Ocosingo Coffee Growers (Orcao, its initials in Spanish) arrived in 16 trucks at the recuperated land, now invaded and damaged, to plan another invasion, headed by the leaders Antonio Juárez Cruz and José Pérez. “They are registering the recuperated land that belongs to our compañero support bases of the Zapatista National Liberation Army (EZLN), and every few days the state preventive police arrive in Guadalupe Victoria to provoke the compañeros. The leaders of Aric “historic” are Marcelo Jiménez Pérez president, Julio and Javier Toledo Córdova. They support the invaders from Las Conchitas. The photograph to the left suggests a story waiting to be told. It shows indigenous women next to their makeshift plastic tent on the plaza in San Cristóbal de las Casas, Chiapas, Mexico. The women are occupying a space on the plaza in front of the San Cristóbal de las Casas Cathedral to protest the unjust imprisonment of their family members, who are on a hunger strike inside three Chiapas prisons. In the background, on a different part of the Plaza, the photograph shows a thatched-roof structure that is part of the exposition pavilion welcoming visitors to the World Summit of Adventure Tourism, taking place in San Cristóbal between October 17 and 20, 2011. The Adventure Travel Trade Association (ATTA) coor­dinated the summit. Key sponsors were the state govern­ment of Chiapas, the government of Mexico and Eddie Bauer, a retailer of outdoor wear. To no one’s surprise, Felipe Calderón, President of Mexico, was one of the keynote speakers. He touted adventure tourism as a source of employ­ment for the indigenous peoples of Chiapas and urged those present to create those jobs. Mexico has adopted tourism development as a panacea for the country’s economic woes. Tourism is one of the largest industries in the world. It is such a large and profitable industry that the United Nations has an organization devoted exclusively to international tourism: The United Nations World Tourism Organization (UNWTO). The UNWTO reports that in 2010, international tourism generated US$ 919 billion in export earnings. The tour­ism industry brings much-needed foreign cash to developing countries and a quick return on investment to developers. Not surprisingly, the UNWTO encourages developing nations to invest in tourism infrastructure in order to attract tourist development and earn foreign cash. Mexico has taken that encouragement to heart. You can see that infrastructure in Chiapas when you land at the new airport in Chiapa de Corzo and take the new toll road to San Cristóbal. Both the new airport and the new toll road were built to facilitate tourism and commerce. Both were infrastruc­ture projects encompassed within the old Plan Puebla-Panamá (PPP), now renamed the Mesoamerica Project. The mega-tourism project underway in Chiapas and envisioned within the Mesoamerica Project is the Palenque Integral Cen­tre, or CIP, its initials in Spanish. The CIP includes the San Cristóbal-Palenque Toll Road, a key infrastructure piece to which there is considerable resistance. 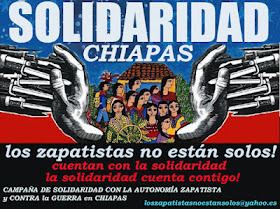 The Chiapas state government has, at least in the recent past, tolerated violence, including murder, kidnapping and torture against members of the EZLN’s Other Campaign in the Mitzitón ejido because they are resisting the construction of the new toll road through their territory. Mitzitón is in the municipality of San Cristóbal, where the toll road is to begin. The purpose of the new toll road is to facilitate tourism devel­opment between San Cristóbal, Agua Azul and Palenque. In addition to murder, kidnapping and torture, the government also uses unjust incarceration as a tactic to break the resistance. 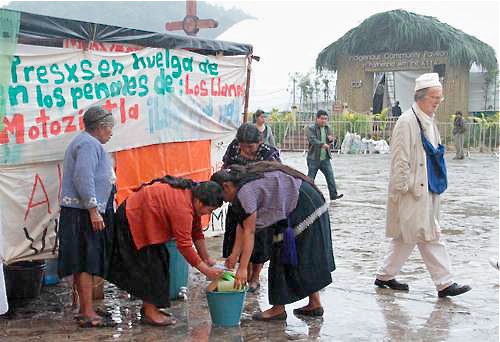 Two of the prisoners participating in the hunger strike were from Mitzitón and had family members occupying Cathedral Plaza, as pictured above. The San Sebastián Bachajón (SSB) ejido is another area along the projected route of the San Cristóbal-Palenque Toll Road. It is slated for mega-development. In February 2011, a mixture of federal, state and local security forces arbitrarily detained 117 people, all from the SSB ejido. Although the lo­cal media portray the dispute as a fight between indigenous peoples over who gets to collect the entrance fees to the Agua Azul Cascades from tourists, the more important and underly­ing conflict is who will control the extremely valuable land surrounding the spectacular series of turquoise blue waterfalls named Agua Azul (Blue Water). Hotels, restaurants, a confer­ence centre and golf course are envisioned for Agua Azul, not to mention a lodge with helipad, but no local family-owned businesses. The tourist development around Agua Azul envi­sions transnational hotel chains and golf course developers. It would also involve taking land away from some of the indigenous population and the forced displacement of that population. That is why they protest and resist. Their peaceful social protest has been repressed and criminalized. The current epicentre of the CIP is the city of Palenque and its archaeological zone/national park of the same name, just 9 kilometres (5.5 miles) from the city. Palenque is expanding its once tiny airport for small planes to accommodate commercial airliners. While the world-famous Palenque archaeological ruins have long been a big tourist attraction, it is projected that within two years it will enter the global market as a prime destination for “light” adventure tourism specifically directed at the US consumer. Preparations for this increased tourism are underway. A report in La Jornada reveals that there is also resistance to the tourism expansion in Palenque. An experienced tourist agent told La Jornada that government officials from different departments, with financial support from US agencies like USAID, are collaborating to make way for privatizing the natural protected areas surrounding the archaeological site. Once privatized, transnational hotel chains would then be able to build hotels and commercial centres on the outskirts of the archaeological zone and to provide tourist services within the newly privatized area. This would bypass existing busi­nesses in the city of Palenque. New guides and new modes of transportation would replace current service providers, such as taxi drivers and tour guides, putting many out of work. (This contradicts Calderón’s claim that tourism development would create jobs in Chiapas.) The new guides are being carefully selected from within pro-government populations. No criticism or dissent is tolerated. Their training omits historic knowledge in favour of “nature tourism” and is geared to the style of US tourists. At least one entire community would be displaced. Thus, the project threatens jobs, homes and a way of life; in other words, it threatens the culture. Therefore, it’s not only Zapatista and Other Campaign communities that will be resist­ing the mass transformation of the city and its surrounding area. Those who provide tourist services and will be displaced by the development projects are expected to join in the resistance. The CIP is just one of the tourist projects envisioned within a comprehensive Mundo Maya (Maya World) concept. Mundo Maya, or Ruta Maya as it is sometimes called, is a regional plan to develop and connect, for the purpose of tourism, Maya archaeological and ecological sites throughout four Central American countries (Guatemala, Honduras, El Salvador and Belize) and five Mexican states (Chiapas, Tabasco, Campeche, Yucatán and Quintana Roo). Development plans in Chiapas are mirrored in other Mexican states and in Central American countries. In Guatemala, for example, a project known as Cuatro Balam (Four Jaguar) has been in the works for several years. The project is developing a tourist corridor between El Mirador and Tikal, both well-known archaeological sites in the Guatemalan department of Petén. Forced displacement of a nearby Maya community accompanied this project. The Flores-Santa Elena Airport near Tikal has been greatly expanded and renamed Mundo Maya Airport. Highways are planned to connect with archaeological sites along the Usumacinta River, the bound­ary between Guatemala and Chiapas. Crossing that river into Chiapas is currently by boat, but there are future predictions of a bridge. 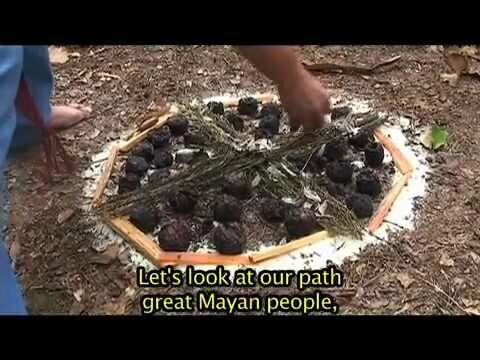 For anyone who follows the development of Mundo Maya projects closely, whether in Chiapas, Guatemala, the Yucatán or Honduras, there is one inescapable conclusion: governments and tourism developers are exploiting the archaeological won­ders of the ancient Maya for personal or corporate profit, while evicting and repressing the modern-day Maya. Time: 09:00 to 14:30 hrs. On Monday 16 April the first preliminary hearing will be held focused on the case of the Massacre of Acteal, Chiapas, as the beginning of thE approach to the background by the Mexican process of the Permanent Peoples’ Tribunal (TPP). Jean Paul Sartre and the ex-Mexican president Lázaro Cárdenasas members of the jury, and is the oldest and most widely recognized ethical tribunal of conscience throughout the world. Director of the Homeless Shelter for Migrants “The 72” in Tenosique, Tabasco; representatives of the Mexican Regional Office of the Rosa Luxemburg Foundation from Germany will also be attending. The event is part of the commemoration of the 15th anniversary of this massacre, which shook Mexico and the world on 22 December 1997, with a toll of 49 slaughtered (four of them as yet unborn), 33 of whom were women and girls (14 girls, 19 women), all of them displaced indigenous people belonging to the civil society organisation Las Abejas. migration, refugee and forced displacement, and dirty war, impunity and state violence.